Pi-Ramesses (/pɪərɑːmɛs/; Ancient Egyptian: Per-Ra-mes(i)-su, meaning "House of Ramesses") was the new capital built by the Nineteenth Dynasty Pharaoh Ramesses II (1279–1213 BC) at Qantir, near the old site of Avaris. The city had served as a summer palace under Seti I (c. 1290–1279 BC), and may have been founded by Ramesses I (c. 1292–1290 BC) while he served under Horemheb. In 1884, Flinders Petrie arrived in Egypt to begin his excavations there. His first dig was at Tanis, where he arrived with 170 workmen. Later in the 1930s, the ruins at Tanis were explored by Pierre Montet. The masses of broken Ramesside stonework at Tanis led archaeologists to identify it as Pi-Ramesses. Yet it eventually came to be recognised that none of these monuments and inscriptions originated at the site. In the 1960s, Manfred Bietak, recognised that Pi-Ramesses was known to have been located on the then easternmost branch of the Nile. He painstakingly mapped all the branches of the ancient Delta and established that the Pelusiac branch was the easternmost during Ramesses' reign while the Tanitic branch (i.e. the branch on which Tanis was located) did not exist at all. Excavations were therefore begun at the site of the highest Ramesside pottery location, Tell el-Dab'a and Qantir. Although there were no traces of any previous habitation visible on the surface, discoveries soon identified Tell el-Dab'a as the Hyksos capital Avaris. Qantir was recognized as the site of the Ramesside capital Pi-Ramesses. Qantir/Pi-Ramesses lies some 30 kilometers to the south of Tanis; Tell el-Dab´a, the site of Avaris, is situated about 2 km south of Qantir. In 2017, archaeologists from the Roemer and Pelizaeus Museum unearthed footprints of children at the bottom of a mortar part, as well as pieces of painted wall, possibly fresco pending further study, believed to have served as decoration at the site of a palace or temple. Ramesses II was born and raised in the area, and family connections may have played a part in his decision to move his capital so far north; but geopolitical reasons may have been of greater importance, as Pi-Ramesses was much closer to the Egyptian vassal states in Asia and to the border with the hostile Hittite empire. Intelligence and diplomats would reach the pharaoh much more quickly, and the main corps of the army were also encamped in the city and could quickly be mobilised to deal with incursions of Hittites or Shasu nomads from across the Jordan. Pi-Ramesses was built on the banks of the Pelusiac branch of the Nile. With a population of over 300,000, it was one of the largest cities of ancient Egypt. Pi-Ramesses flourished for more than a century after Ramesses' death, and poems were written about its splendour. According to the latest estimates, the city was spread over about 18 km2 (6.9 sq mi) or around 6 km (3.7 mi) long by 3 km (1.9 mi) wide. Its layout, as shown by ground-penetrating radar, consisted of a huge central temple, a large precinct of mansions bordering the river in the west set in a rigid grid pattern of streets, and a disorderly collection of houses and workshops in the east. The palace of Ramesses is believed to lie beneath the modern village of Qantir. An Austrian team of archaeologists headed by Manfred Bietak, who discovered the site, found evidence of many canals and lakes and have described the city as the Venice of Egypt. A surprising discovery in the excavated stables were small cisterns located adjacent to each of the estimated 460 horse tether points. Using mules, which are the same size as the horses of Ramesses' day, it was found a double tethered horse would naturally use the cistern as a toilet leaving the stable floor clean and dry. It was originally thought the demise of Egyptian authority abroad during the Twentieth Dynasty of Egypt made the city less significant, leading to its abandonment as a royal residence. 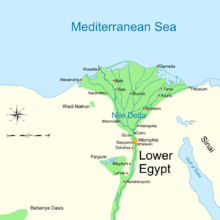 It is now known that the Pelusiac branch of the Nile began silting up c. 1060 BCE, leaving the city without water when the river eventually established a new course to the west now called the Tanitic branch. The Twenty-first Dynasty of Egypt moved the city to the new branch establishing Djanet (Tanis) on its banks, 100 km (62 mi) to the north-west of Pi-Ramesses as the new capital of Lower Egypt. The Pharaohs of the Twenty-first Dynasty transported all the old Ramesside temples, obelisks, stelae, statues and sphinxes from Pi-Ramesses to the new site. The obelisks and statues, the largest weighing over 200 tons, were transported in one piece while major buildings were dismantled into sections and reassembled at Tanis. Stone from the less important buildings was reused and recycled for the creation of new temples and buildings. The biblical Book of Exodus mentions "Ramesses" as one of the cities on whose construction the Israelites were forced to labour (Exodus 1:11) and from where they departed on their Exodus journey (Exodus 12:37 and Numbers 33:3). Understandably, this Ramesses was identified by biblical archaeologists[who?] of the nineteenth century with the Pi-Ramesses of Ramesses II. Still earlier, the 10th-century Bible exegete Rabbi Saadia Gaon believed that the biblical site of Ramesses had to be identified with Ain Shams. When the 21st Dynasty moved the capital to Tanis, Pi-Ramesses was largely abandoned and the old capital became a quarry for ready-made monuments, but it was not forgotten: its name appears in a list of 21st Dynasty cities, and it had a revival under Shishaq, usually identified with the historical pharaoh Shoshenq I of the 22nd Dynasty (10th century BCE), who tried to emulate the achievements of Ramesses. The existence of the city as Egypt's capital as late as the 10th century BCE makes problematic the reference to Ramesses in the Exodus story as a memory of the era of Ramesses II; and indeed, the shortened form "Ramesses", in place of the original Pi-Ramesses, is first found in 1st millennium BCE texts. The Bible describes Ramesses as a "store-city". The exact meaning of the Hebrew phrase is not certain, but some have suggested that it refers to supply depots on or near the frontier. This would be an appropriate description for Pithom (Tel El Maskhuta) in the 6th century BCE, but not for the royal capital in the time of Ramesses, when the nearest frontier was far off in the north of Syria. Only after the original royal function of Pi-Ramesses had been forgotten could the ruins have been re-interpreted as a fortress on Egypt's frontier. ^ Tyldesley, Joyce (October 30, 2001). Ramesses: Egypt's Greatest Pharaoh. Penguin. p. 90. ISBN 978-0-14-028097-5. ^ a b c d Miller, James Maxwell; Dearman, J. Andrew; Graham, M. Patrick (2001-01-01). The Land that I Will Show You: Essays on the History and Archaeology of the Ancient Near East in Honor of J. Maxwell Miller. A&C Black. ISBN 9781841272573. ^ a b K. A. Kitchen. On the Reliability of the Old Testament. Grand Rapids, Michigan. William B. Eerdmans Publishing Company. 2003, p.255. ISBN 0-8028-4960-1. ^ Saadia Gaon, Judeo Arabic Translation of Pentateuch (Tafsir), s.v. Exodus 21:37 and Numbers 33:3 ("רעמסס: "עין שמס); Rabbi Saadia Gaon's Commentaries on the Torah (ed. Yosef Qafih), 4th edition, Mossad Harav Kook: Jerusalem 1984, p. 164 (Numbers 33:3) (Hebrew) OCLC 896661716. Abraham Ibn Ezra suggests that there may have actually been two distinct sites by the name of Rameses, based on the different Masoretic vowelization of "Rameses" in Exodus 1:11 and 12:37, one a store city and the other a district in or near Goshen, as implied by Genesis 47:11. ^ Sagrillo, Troy Leiland. 2015. “Shoshenq I and biblical Šîšaq: A philological defense of their traditional equation.” In Solomon and Shishak: Current perspectives from archaeology, epigraphy, history and chronology; proceedings of the third BICANE colloquium held at Sidney Sussex College, Cambridge 26–27 March, 2011, edited by P. J. James, P. G. van der Veen, and R. M. Porter. British Archaeological Reports (International Series) 2732. Oxford: Archaeopress. 61–81.